[04/11/2019 @ 07:22 AM] Book this fare on: Priceline, BookingBuddy, Travelocity, SkyScanner, Expedia, Orbitz, Hotwire, CheapTickets. 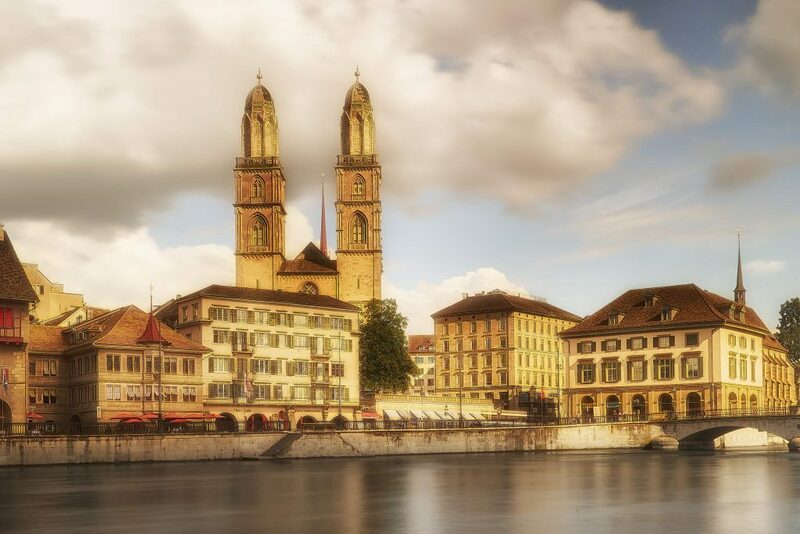 American Airlines and British Airways have round-trip flights from Houston (IAH) to Zurich (ZRH) for $395-$419 with a connection. September to February. 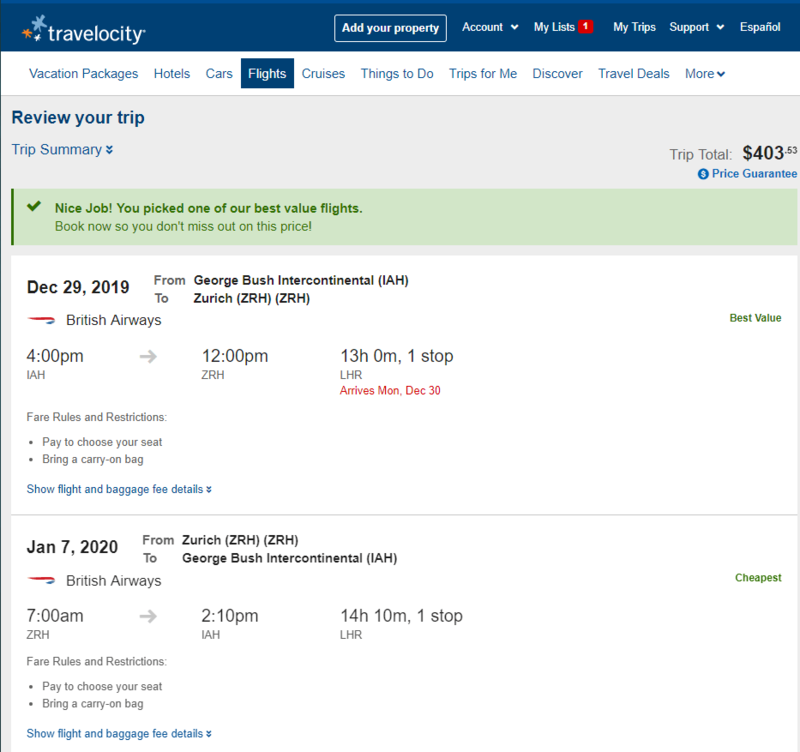 Note: New Years Eve is available if you can do a 10-day stay or longer. Note: Carry-on bag is allowed for free on American Airlines and British Airways. You can avoid paying for seat selection by accepting the randomly assigned seat at the gate. Example Dates: (BookingBuddy / Travelocity) Sep 10 – Sep 17 / Sep 16 – Sep 23 / Sep 22 – Sep 29 / Sep 23 – Sep 30 / Sep 24 – Oct 01 / Sep 25 – Oct 02 / Sep 30 – Oct 07 / Oct 01 – Oct 08 / Oct 02 – Oct 09 / Oct 03 – Oct 10 / Oct 06 – Oct 13 / Oct 07 – Oct 14 / Oct 09 – Oct 16 / Oct 10 – Oct 17 / Oct 13 – Oct 20 / Oct 14 – Oct 21 / Oct 16 – Oct 23 / Oct 20 – Oct 27 / Oct 21 – Oct 28 / Oct 22 – Oct 29 / Oct 23 – Oct 30 / Oct 24 – Oct 31 / Oct 27 – Nov 03 / Oct 28 – Nov 04 / Oct 29 – Nov 05 / Oct 30 – Nov 06 / Oct 31 – Nov 07 / Nov 01 – Nov 08 / Nov 02 – Nov 09 / Nov 03 – Nov 10 / Nov 04 – Nov 11 / Nov 05 – Nov 12 / Nov 06 – Nov 13 / Nov 07 – Nov 14 / Nov 08 – Nov 15 / Nov 09 – Nov 16 / Nov 10 – Nov 17 / Nov 11 – Nov 18 / Nov 12 – Nov 19 / Nov 13 – Nov 20 / Nov 14 – Nov 21 / Nov 15 – Nov 22 / Nov 16 – Nov 23 / Nov 17 – Nov 24 / Nov 18 – Nov 25 / Nov 19 – Nov 26 / Nov 20 – Nov 27 / Nov 26 – Dec 03 / Nov 27 – Dec 04 / Nov 28 – Dec 05 / Nov 29 – Dec 06 / Nov 30 – Dec 07 / Dec 01 – Dec 08 / Dec 02 – Dec 09 / Dec 03 – Dec 10 / Dec 04 – Dec 11 / Dec 05 – Dec 12 / Dec 06 – Dec 13 / Dec 07 – Dec 14 / Dec 08 – Dec 15 / Dec 09 – Dec 16 / Dec 10 – Dec 17 / Dec 29 – Jan 07 / Jan 05 – Jan 12 / Jan 07 – Jan 14 / Jan 08 – Jan 15 / Jan 09 – Jan 16 / Jan 10 – Jan 17 / Jan 11 – Jan 18 / Jan 12 – Jan 19 / Jan 13 – Jan 20 / Jan 14 – Jan 21 / Jan 15 – Jan 22 / Jan 16 – Jan 23 / Jan 17 – Jan 24 / Jan 18 – Jan 25 / Jan 19 – Jan 26 / Jan 20 – Jan 27 / Jan 21 – Jan 28 / Jan 22 – Jan 29 / Jan 23 – Jan 30 / Jan 24 – Jan 31 / Jan 25 – Feb 01 / Jan 26 – Feb 02 / Jan 27 – Feb 03 / Jan 28 – Feb 04 / Jan 29 – Feb 05 / Jan 30 – Feb 06 / Jan 31 – Feb 07 / Feb 01 – Feb 08 / Feb 02 – Feb 09 / Feb 03 – Feb 10 / Feb 04 – Feb 11 / Feb 05 – Feb 12 / Feb 06 – Feb 13 / Feb 07 – Feb 14 / Feb 08 – Feb 15 / Feb 09 – Feb 16 / Feb 10 – Feb 17 / Feb 11 – Feb 18 / Feb 12 – Feb 19 / Other dates: There are more dates available than the ones we list here, experiment on your own. I was able to pull this up on Travelocity. Screenshot taken when this post was initially created. See timestamps at the top of this post.